When Childe Hassam stepped off the ferry onto the rocks of Appledore Island, he found the place that would occupy his imagination for three decades. Comfortably ensconced in a rambling resort, waking to bright sun and Atlantic breezes, the artist gave himself over to painting en plein air. Hassam created a body of work that remains a pinnacle of American impressionism. This is the first exhibition in more than 25 years to focus on Hassam's paintings of the Isles of Shoals, a group of small, rocky islands lying in the Gulf of Maine& six miles off the coast of Portsmouth, New Hampshire. 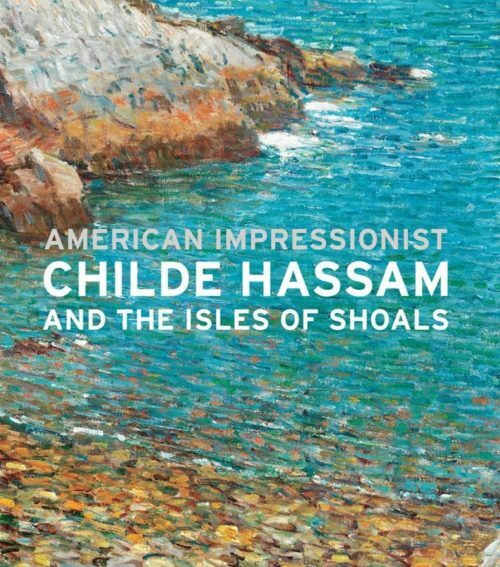 American Impressionist: Childe Hassam and the Isles of Shoals is the result of an unprecedented collaboration of research between geologists, marine scientists and curators that led to new discoveries about Hassam's paintings and artistic practice. The exhibition features more than 40 oil paintings and watercolors dating from the late 1880s to 1912, offering a sustained reverie on nature, the pleasure of painting and a rapturous sense of place and color: a celebrated island garden with its gem-like flowers, dense thickets of bayberry wedged in granite crags, and the dark ocean breaking against rocks and swirling in tidal pools. The Peabody Essex Museum dedicates its presentation of this exhibition to the memory of Carolyn A. Lynch (1946-2015), visionary supporter of education, art and culture and dedicated PEM trustee and patron. The Peabody Essex Museum and the North Carolina Museum of Art co-organized this exhibition in cooperation with the Shoals Marine Laboratory. Carolyn A. and Peter S. Lynch and The Lynch Foundation provided generous support. The East India Marine Associates of the Peabody Essex Museum also provided support.